My children are responsible for placing me on different paths in the culinary world. Their encouragement and positive reviews also make all the work and preparation worth it. Nothing is more rewarding to the chef than to have someone appreciate the food you make. It’s the only reward you need. Years ago my sons got me a smoker. That summer I was having a ball experimenting with smoked meats and fish and telling the whole neighborhood that smelling hickory smoke all day is a good thing. The most recent addition to my kitchen arsenal is a slow cooker. My children got me a slow cooker for my birthday this year. I have not had one since the 70’s, and back then we called them crock pots. Today’s slow cookers come with some nice modern electronic features that helps you control and hold the cooking process. But in the end, all it does is slowly cook your food at low temperatures resulting in a tender, fall off the bone meat dish with tons of infused flavor. Mmmmmm! So naturally, I’m now experimenting using my new slow cooker with some time-tested recipes I know. 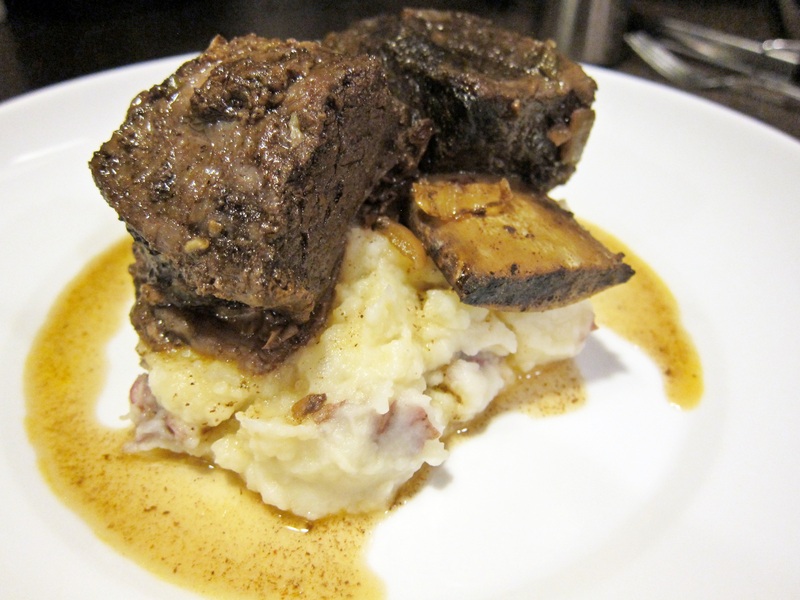 Braised short ribs heads my list of things to try. So here you go. What’s not to love about short ribs. If prepared properly, it’s one of the most tastiest, beefy , mouth-watering morsels you can put in your mouth. I thought it would be fitting to include my new slow cooker in my short rib recipe and put it to work. This dish takes two days to prepare, so just know, in the end, it’s worth it. Once prepared and cooked you can chill your short ribs for a few days before you heat and serve them. They only get better with time. In a glass 13 x 9 inch glass baking dish, such as Pyrex, combine the coffee, vinegar, brown sugar, onion, garlic, jalapeno, bay leaves, paprika, salt and pepper, cayenne and thyme. Add the short ribs and turn to coat, leaving the meaty part facing down in the marinade. Cover the dish with plastic wrap and refrigerate overnight. The next day take the marinated short ribs out of the refrigerator an hour before cooking them. Place all the short ribs and marinade in your slow cooker and cover. Cook on high for 5 1/2 – 6 hours or low 11 to 12 hours. Both time tables gives you great results, it’s just a matter of how long you want them in for. If you’re home while cooking you might want them done sooner. If you set it and leave for the day the longer time will work for you. Remove the short ribs from the liquid and place covered in the refrigerator. Pour the liquid into a container and allow the liquid to cool to remove the fat layer. When you are ready to reheat the meal, strain the liquid of all the solids and place into your slow cooker. Add the meat and reheat the meat and the liquid just before serving. An hour on high should do the trick. If you want more intense flavor, reduce the liquid by half in a sauce pan. 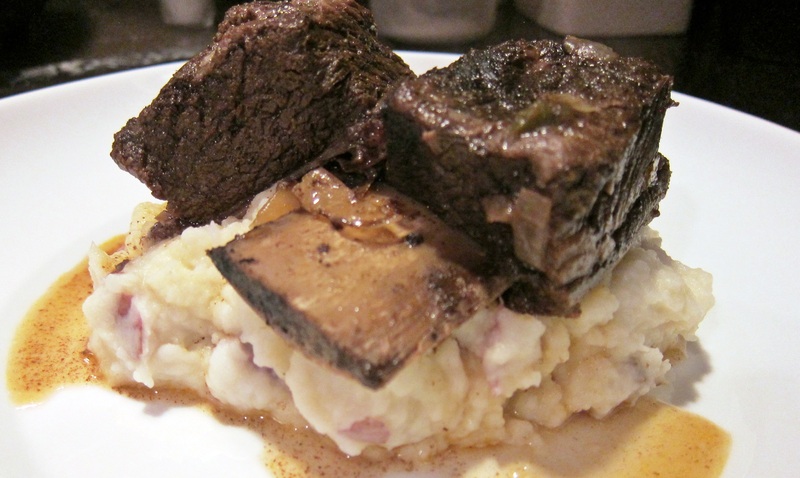 I serve these short ribs over a mound of mashed potatoes with the gravy drizzled over all. Make a green vegetable side dish and your meal is ready. I know, this is the third sourdough posting in a row. I’m having fun with it and want to share. I know this is not Italian food. But it’s my food. And I think my readers trust me that when I post something it has to be good. And this is really good. There really is no substitute for sour dough. 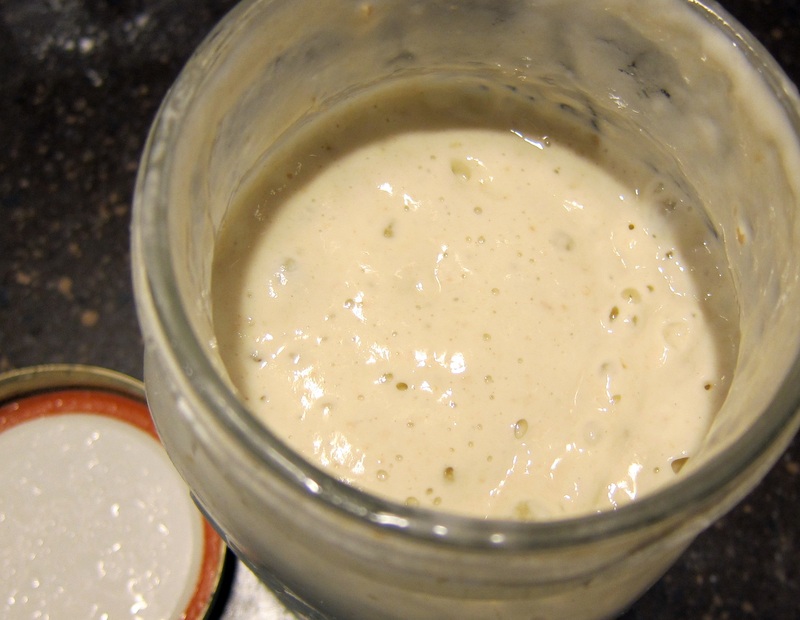 You need to take the first step and develop your own sourdough starter. It’s easy and simple. My first posting, Sourdough Bread, has the instructions on how to develop those little beasties right in your own kitchen. Sourdough pancakes don’t taste like any other pancake. Not buttermilk or buckwheat, they have a flavor all their own. Whenever I have a high carb breakfast, like a bowl of oatmeal or pancakes or waffles, I’m usually hungry three hours later. It’s like a flash in the pan. The carbs burn up quickly and I’m left starving before lunch. Not with Sourdough Pancakes. 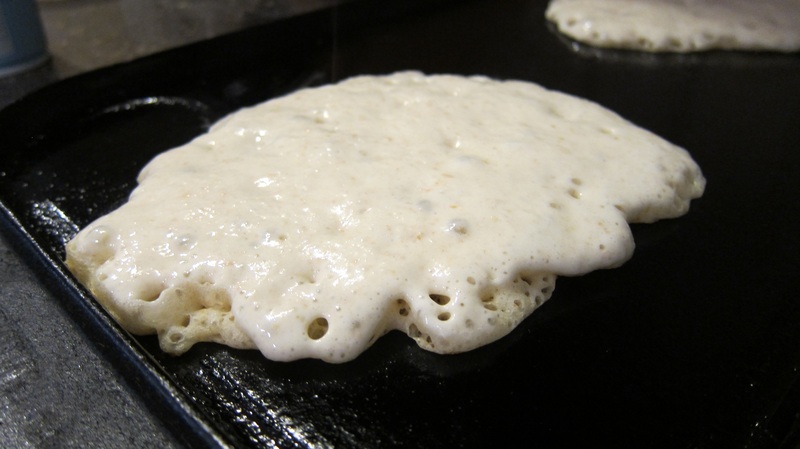 Sourdough pancakes have nothing in common with other pancakes, except in shape and color. And the proof is in the pudding, or sourdough. After a breakfast of sourdough pancakes I’m good until lunch, late lunch. These hotcakes really stick to your ribs. It has to be the high protein content of sourdough. The fermentation of the wild yeast changes things in the flour. It breaks down the grain into amino acids and makes it tolerable even for the gluten intolerant. If you are interested in all the health benefits of sourdough you should read this article by Sasha Navazesh. I’ve been making pancakes since the age of 9 or 10. When my mother Rose would get up in the morning and start making breakfast for by brother Richard and sister Annette, I would sit it out. “I’ll make my own breakfast, Mom”, I would say to her dismay. I just liked the way I did it better. My mother was a great cook. 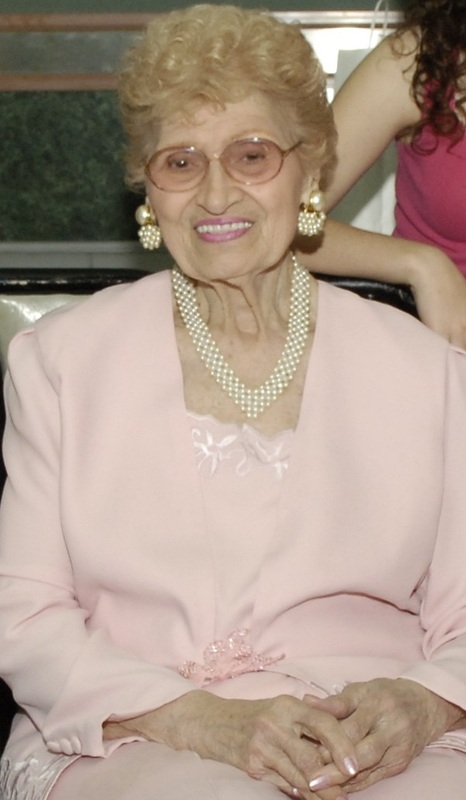 I learned everything I know from her and my Grandmother. But my breakfast had to be a certain way. Till this day, when I make breakfast for my sons, they tell me that no one makes bacon and eggs or pancakes and waffles like I do. By now I think I have it down pat. These sourdough pancakes are worth the effort of keeping a pot of sourdough starter going just for them. 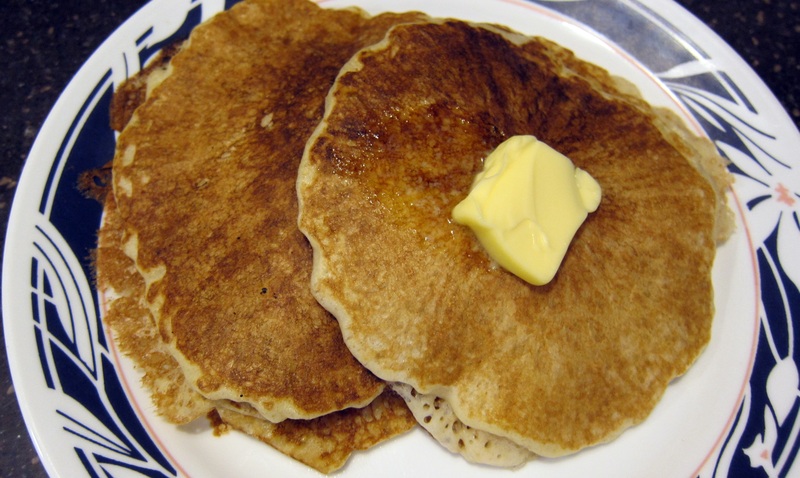 They are the most tasty, lightest and satisfying hotcakes I ever had. 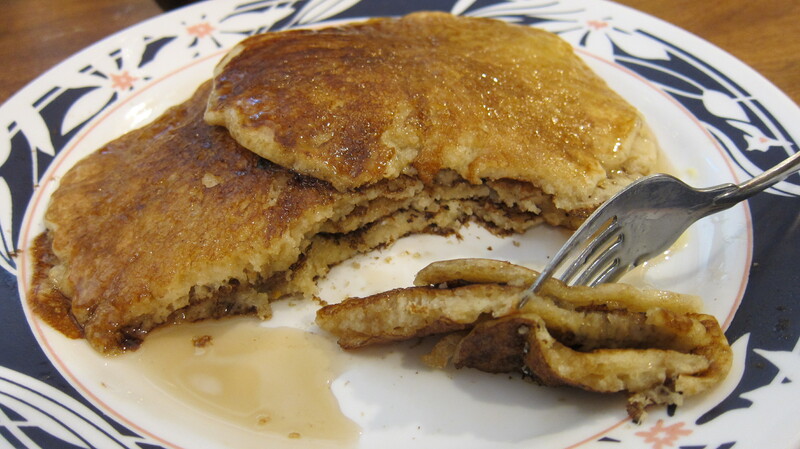 And they taste nothing like regular pancakes, even with all the added butter and syrup and honey you put on. These hotcakes stand alone. 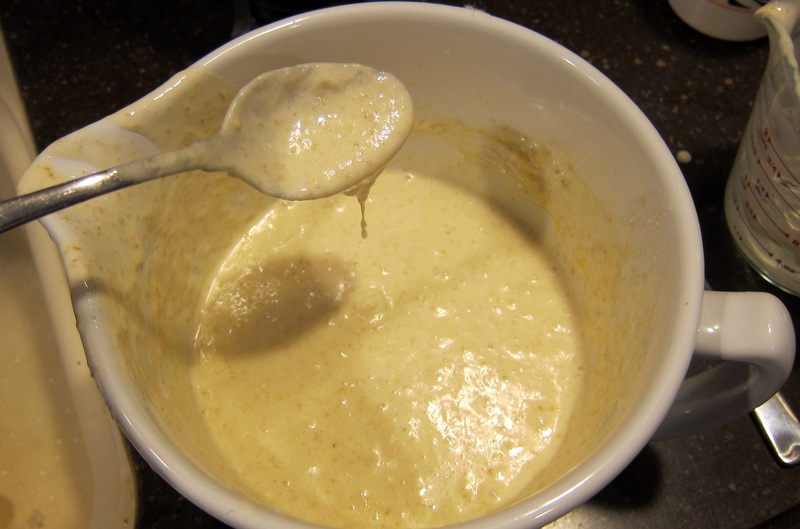 The night before I want to make pancakes I take out my sourdough from the refrigerator, stir it up and place a cup of it in a large mixing bowl. I replace what I took out of my sourdough container with a cup of flour and half cup of filtered water. I let it sit on the counter for an hour before I place it back in the fridge to be ready for my next recipe. To the cup of sourdough I just placed in the mixing bowl, I add a cup of flour and a cup of filtered or spring water. Stir it up, and cover the top with a paper towel or plastic wrap, and let it sit on your counter overnight. The next morning I should have a full 2 cups of bubbling active sourdough in my bowl. Check to see if it’s the consistency you want in your pancake batter. You can add more water or flour at this point to get it there. Beat the egg and add that to the sourdough, along with the salt, melted butter and sugar. Stir it up well. 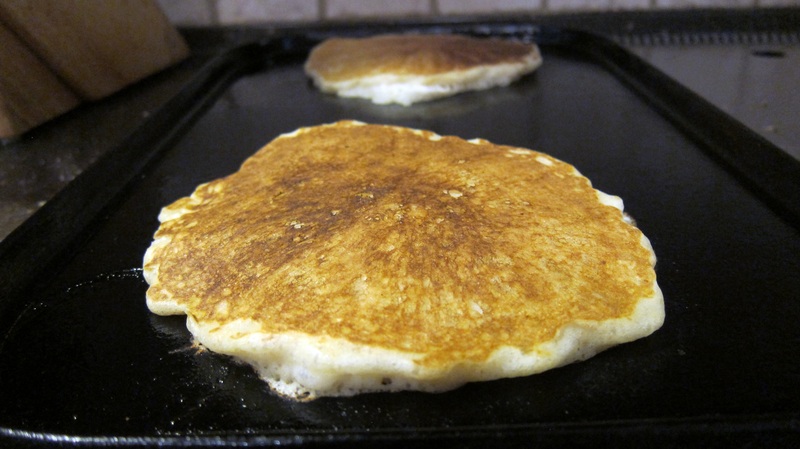 Leave the baking soda to the very end when your griddle is hot and ready. Once you have your griddle hot, butter it with some butter. Add the baking soda mixed with 1 tablespoon of warm water and gently fold this into your sourdough. Don’t mix it hard . You will notice the soda reacting to the sourdough and bubbling up. Pour your sourdough batter onto the hot grill. Wait till the top bubbles before turning. Turn only once and NEVER pat down your pancake with your spatula. Leave it until you are ready to place it on your plate. Top with butter, honey or syrup and enjoy. If you want blueberry sourdough pancakes add a handful of blueberries to the pancake you just poured onto the griddle. Flip it over when ready and enjoy. I have to say, these hotcakes are good enough to have for dinner. Add some breakfast sausage or bacon or smoked ham to the side and a hot cup of Joe and your set. Guess what I’m having for dinner tonight? 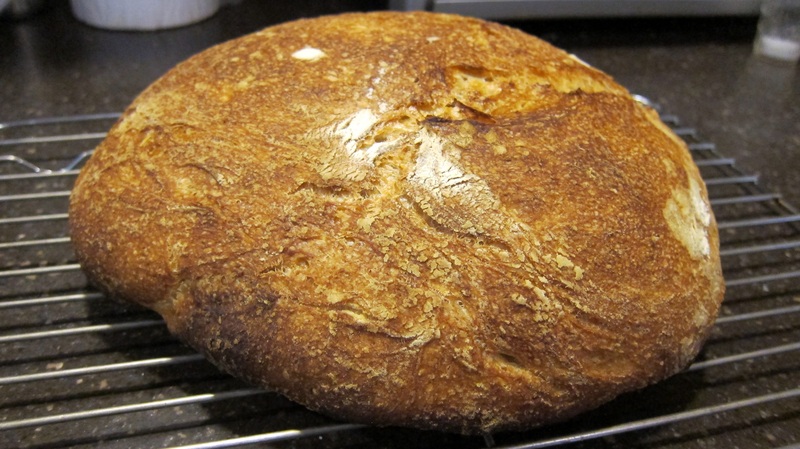 Some of you might have heard of No Knead bread. It’s relatively a new concept in the world of bread making. 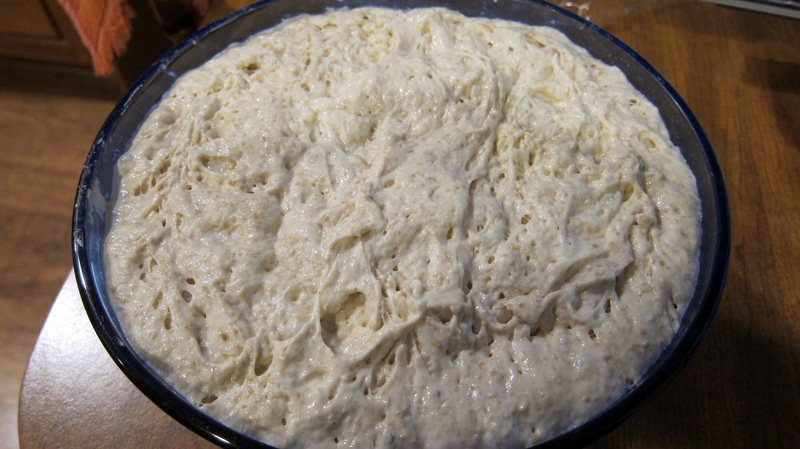 The idea is to leave a very wet dough to rise over a long period of time which helps develop the gluten strands. This takes the place of kneading. This process gives the bread a wonderful airy center crumb and crisp crust. Also it’s baked in a large pot or dutch oven covered. If you were using commercial yeast you would use maybe a quarter of what is needed to leaven the amount of flour in the recipe. That’s why you can let the dough sit from 12 to 18 hours waiting for it to rise. Making a sourdough no knead bread uses the same idea except the wild yeast from your starter gives the bread an added sourdough tang. That’s something you just can’t get from commercial years. If you do not have your own sourdough starter please reference my previous post Sourdough Bread. There I explain the way you can capture your own wild yeast and make a starter culture that you can use forever in your bread making adventure. Why bother buying yeast when mother nature provides all you can ever want. Some starter might be thinner than needed for this recipe. The best way I can figure to have the right starter consistency is to place the 1/4 cup starter in a large mixing bowl and add 1-2 tablespoons of flour and stir till you get the consistency of a dough that will just about hold its own shape. This amount of flour is above the 16 ounces needed for the recipe. Add the warm water to your starter ball and mix to dissolve the starter as much as possible. Add the salt and stir. Add about 8 ounces of the flour and stir with a wooden spoon until you have a sticky mass. Add the rest of the flour and stir till it’s all incorporated. That stirring motion is what also helps develop the gluten strands. Cover the bowl with plastic wrap and allow to rise in a warm place for 18 hours. Best temperature is 80-85 degrees F. I found if I turn my oven on for 25 seconds and then shut it off, the temperature inside the oven will reach 85 degrees F. It will stay close to that for the 18 hours. Just make sure you have a kitchen thermometer handy to make sure of the temperature. If you are doubtful, just leave it on your kitchen counter. Liberally flour your work surface. Scrape out the dough onto your work surface. Sprinkle more flour over the dough and gently fold the ends onto each other on all four sides, like folding a piece of paper before putting it in an envelope. Do this twice. Allow the dough to rest 15 minutes. Sprinkle some flour in a greased bowl that will hold the dough with enough room to double in size. Allow the dough to rise 2 hours in the bowl covered. The best possible place you can bake this bread is in a La Cloche. 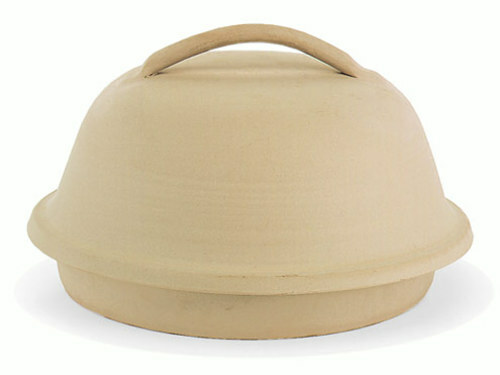 If you don’t have one, a large dutch oven with a lid or enameled cast iron pot such as Le Creuset works just as well. 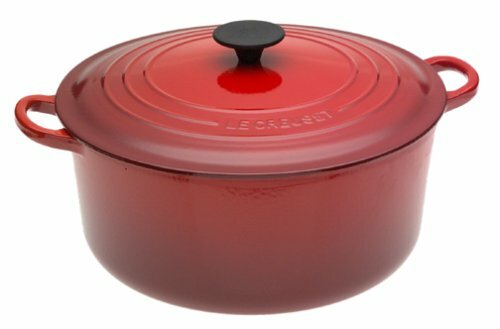 Preheat your oven to 500 degrees F with the La Cloche, or whatever you are using, in the oven. Pull out the oven shelf halfway and with an oven mitt, remove the cover and place close by. With your thumbs on the bottom of the bowl with the sour dough and your four fingers of each hand lightly holding the top of the dough, flip the bowl over and “dump” the dough onto the La Cloche pan or pot, releasing the dough with your fingers once it’s over the pan. Quickly put back on your oven mitt and cover the pan. Slide the shelf back into the oven and bake for 30 minutes. Lower the oven to 450 degrees F and remove the lid and bake another 10-15 minutes until your loaf is golden brown. Cool the loaf on a wire rack for at least 30 minutes before slicing into it. I know, it will be hard, control yourself. 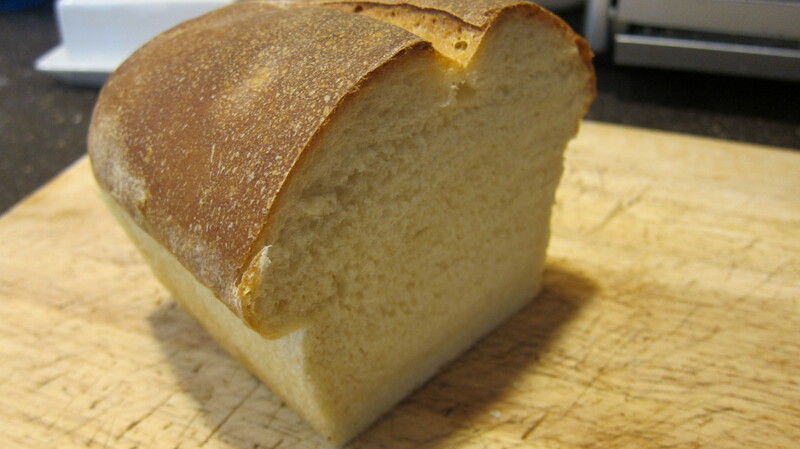 If you cut it when the bread is too hot you will ruin the crumb, the inside of the loaf. You can take this time to listen to the loaf “crackle” as it cools. Or, whatever you feel like doing. Just wait the full 30 minutes. I have been playing around with sourdough again. I was doing it for years and then I lost my sourdough culture after Superstorm Sandy. I lost my power for two weeks and whatever I had in my refrigerator was gone. I wasn’t in the frame of mind to save anything, other than the essentials, milk, eggs, etc. No power, no water, no heat. I was just trying to get through day by day. It was at that point I stopped making sourdough. A couple of weeks ago my son Joseph mentioned some of the best bread he ever ate was my sourdough bread. He planted the seed. I had to start from scratch. If you never had sourdough bread you have missed the way bread was made for thousands of years. The ancient Egyptians used wild yeast to ferment alcoholic beverages and leaven bread over 5,000 years ago. It wasn’t till the 1860’s and the invention of the microscope did scientist isolate these tiny organisms as yeast. Once they did that they were able to select pure strands of yeast and started to use them in commercial baking. It was a boom for bakers, they were able to produce bread in record time. Only problem was they bypassed the fermentation stages of bread making and lost the amazing taste that came with it. Wild yeast takes much longer to leaven bread than modern commercial yeast. When the dough sits for 8-16 hours many other things happen. Real sour dough is probiotic, like yogurt. So not only is it better for you, but the taste is unequaled. The lactic acid that is produced during the fermenting period gives the sour dough that tang. I’m not going to get into all the health benefits. Let’s just say the Roman soldiers and Yukon miners all lived off of sourdough bread. It gave them all the protein and nutrients they needed. 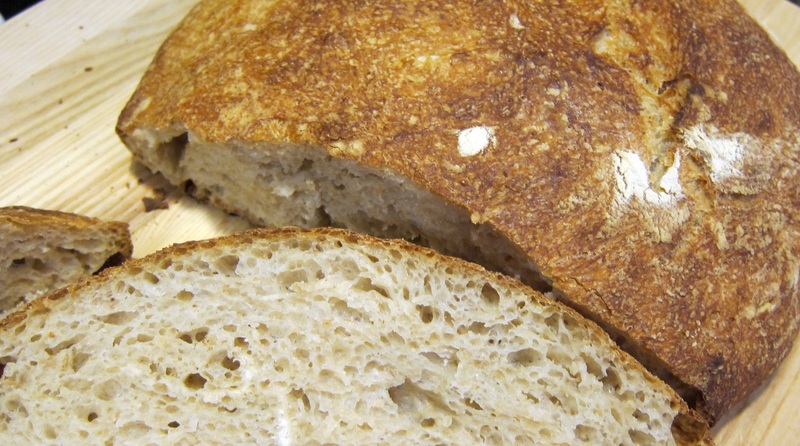 Sourdough also breaks down the gluten in the grain resulting in bread that gluten sensitive people can eat. To get myself started, I took a plastic pint container and added a cup of purified water (you don’t want any chlorine or other chemicals in the water) or bottled spring water and added that to the container along with a half cup of bread flour and half cup of whole wheat flour. I mixed it all together well. I left the container on my window sill with the cover placed loosely on top for 24 hours. The next day the “batter” looked just like flour and water. No activity yet. It takes 4-6 days before you see the bubbles of any active wild yeast. I discarded 1/2 cup of the batter and mixed in another 1/2 cup of water and 1 cup of bread flour. I placed it back on the window sill and let it sit for another 24 hours. After the second day there still was no activity. I repeated the procedure the third day, empty 1/2 cup of batter and add in 1/2 cup water and 1 cup of flour. By the fourth day I began to see bubbles in the mixture. The wild yeast from the air and flour started growing. If you smell it at this point is has a yeasty smell. I continued emptying a half cup of batter and adding a half cup of water and cup of flour for another three days. By now the starter was fully active. Within 4 to 6 hours of feeding it I was able to see the expansion of the culture. At this point I placed it all in a wide mouth quart Mason jar. This will be my sour dough cultures new home. Will will call this mixture “starter”. If you left the starter out at room temperature you would have to feed it every 6 hours or so. It would get to the point where it would over flow the glass jar. Being we are not commercial bakers, we might only bake bread once a week. So you have to keep your starter in the refrigerator to slow down the process and “deactivate” the yeast. 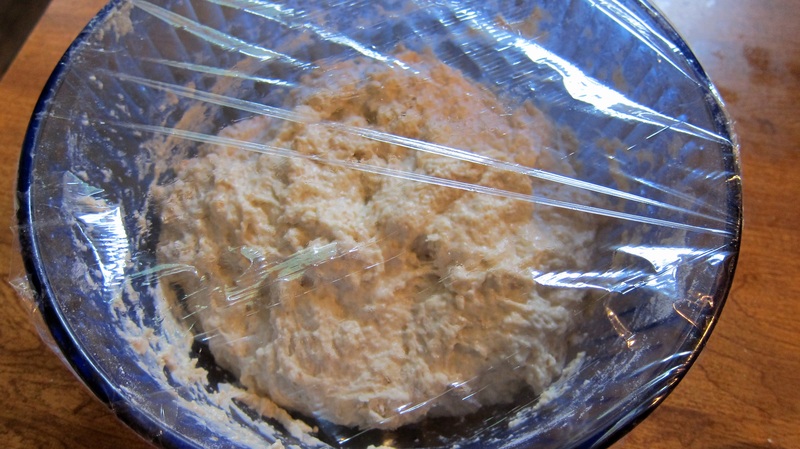 You need to take the starter out a day or two before your bread making in order to reactivate it. It’s quite simple to do. After the starter has been in the fridge for a week, take it out, stir it up well and empty out and discard a 1/2 cup of starter. Add 1/2 cup of warm water and 1 cup of flour. Stir well and leave at room temperature. At this point you only want the jar 3/4 full. You need the extra space for it to expand without over flowing. NEVER TIGHTEN THE LID. JUST LOOSELY PLACE ON TOP. Other wise the jar could explode from the pressure of the gas released by the yeast. You will notice that within 6 hours or so the starter is expanding to the top of the jar. I keep the consistency of my starter like a really thick pancake batter, not too runny and not too stiff. You should be able to stand a spoon up in it. You can adjust by adding more or less water till you get to the consistency you want. If you leave the starter in the refrigerator for more than a week you will notice a dark liquid forming on the top. That’s fine. We call that “hooch” . It actually protects the yeast from bad bacteria forming. When you are ready to use it just stir it back into the starter and begin. So, we begin with a starter that has been dormant for over a week. I take it out about a day before I want to make bread. Stir it up and discard at least a half a cup. I now place in 1/2 cup of warm water and stir it in good. I then add 1 cup of bread flour and stir it in well. I place the lid on loosely and leave it at room temperature for at least 6 hours. You should notice the starter growing. When it reaches the top of the lid it’s activated and ready to use. At this point whatever you use, replace with 1/2 cup of water and 1 cup of flour and leave on the counter to activate for about 4-6 hours before placing it back in the refrigerator and ready for your next loaf of bread. It’s not as complicated as it sounds. 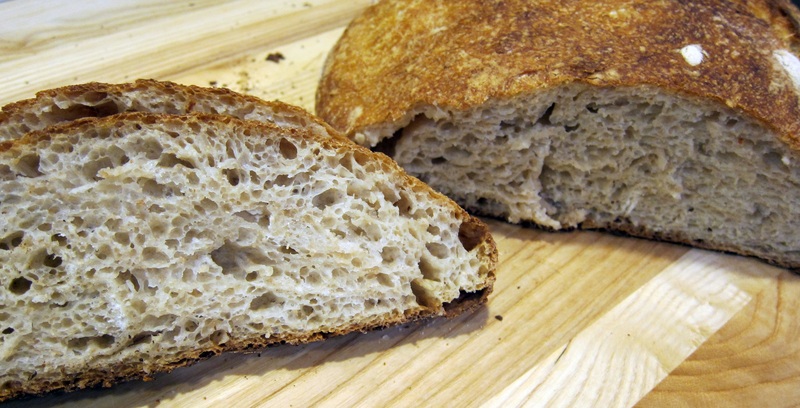 If you got the bug to make homemade bread the conventional way, using sourdough starter is just the next logical step. And once you start you will not want to make bread any other way. But remember, real bread making is a time-honored process. And the more time the bread sits, the better it will taste and the better it is for you. I adapted a recipe I had to make basic white bread using my sourdough starter. This makes 2 loafs of the best tasting, superior toasting sandwich bread you ever had! I also use my KitchenAid stand mixer with the dough hook. Place milk, sugar, salt and butter in a small saucepan and heat over low flame until the butter melts. Remove from the heat and cool to lukewarm. Place the 1/2 cup of sourdough starter in the mixing bowl. A tablespoon at a time, add flour and mix with a spoon until you have a firm dough that will keep its shape. The flour you use here is in addition to the 5-6 cups. Add the cooled milk mixture along with the 1 1/2 cups of warm water and mix well dissolving the ball of starter. Place the bowl on the mixer with your dough hook. Add 4 1/2 cups of flour and turn it slowly up to speed 2 and mix for 1 minute. Continue on speed 2, add the remaining flour, 1/2 cup at a time and mix about 2 minutes, or until the dough clings to the hook and cleans the sides of the bowl. Knead on speed 2 about 2 minutes longer, or until the dough is smooth and elastic. Dough will be slightly sticky to the touch. 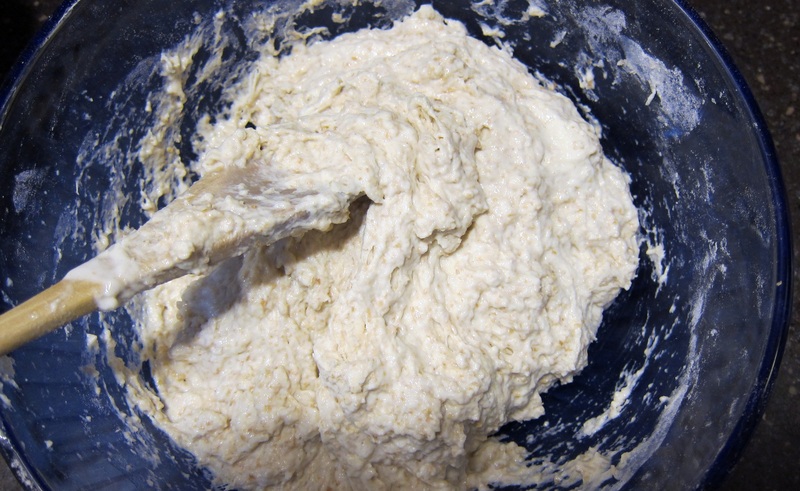 Place the dough in a greased bowl, turning to grease the top. Cover and let rise in a warm place for 6 hours, or until doubled in bulk. I found the best place to make the dough rise in a controlled environment is in my oven. I turn on the oven for about 20 seconds and then turn it off. I keep a thermometer in the oven with the dough to make sure the temperature is within 80-85 degrees F. This is the optimum temperature for the dough to rise in. Another trick to keep the oven at this temperature is to turn on the oven lights. The heat generated from the light will keep the temperature about 85 degrees. Just keep an eye on it so it doesn’t go above that. Punch the dough down and divide in half. 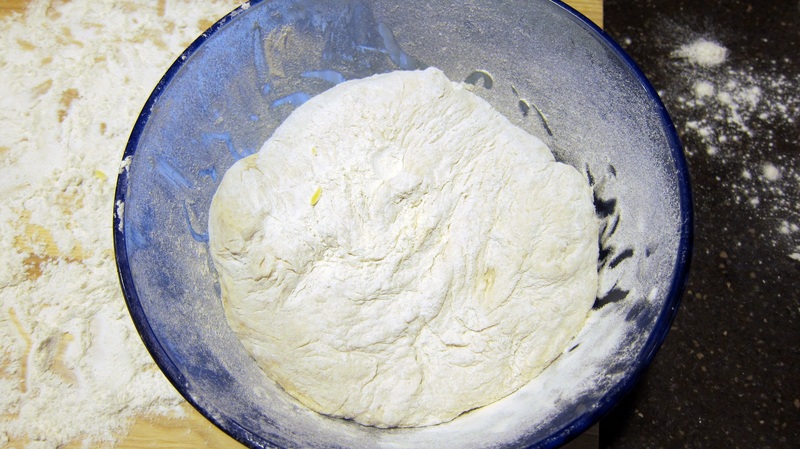 To make a loaf, on a lightly floured surface, roll each half into a rectangle approximately 9×14 inches. 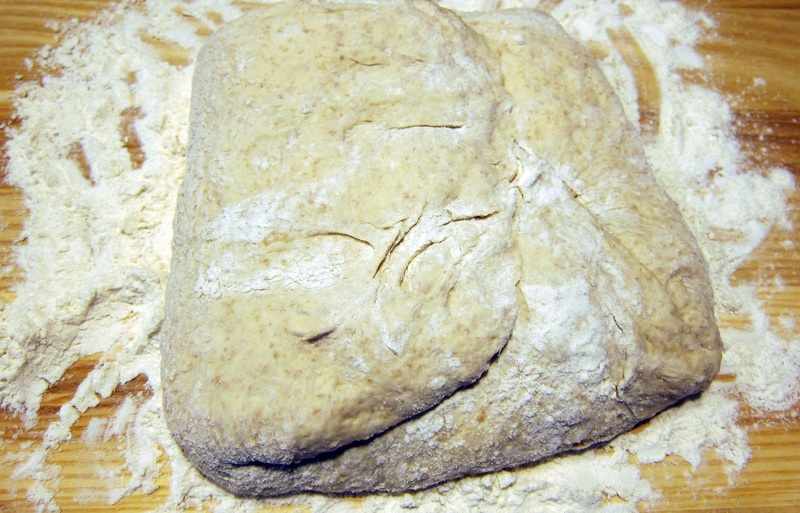 A rolling-pin will smooth dough and remove gas bubbles. Starting at the short end, roll dough tightly. Pinch dough to seal seam. Pinch ends and turn under. Place, seam side down in a greased loaf pan. Cover and let the dough rise in a warm place for at least 2 1/2 hours, or until doubled in bulk. Score the top with a serrated knife and bake at 400 degrees F for 30 minutes, or until golden brown. Remove from the pans immediately and cool on a wire racks for at least 30 minutes before cutting. 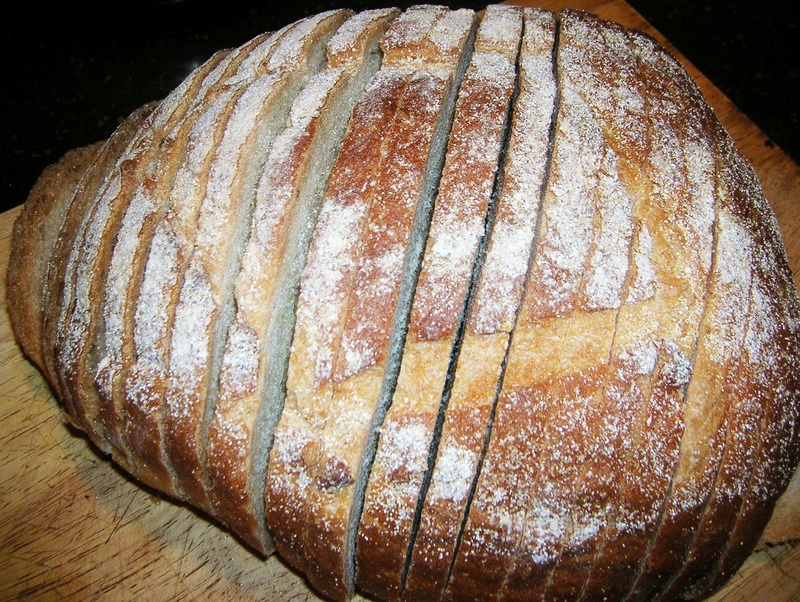 I will share my recipe for sourdough peasant bread on my next blog. Here is another classic Sicilian dish that you can throw together with a few seasonal ingredients and walk away with a satisfying meal, that’s tasty and fresh. This time of year the mint should be plentiful from your garden and the young zucchini is ripe for the picking. If you don’t grow this yourself, farmers markets and grocery stores have all these ingredients fresh this time of year. My son Joseph was surprised that mint would taste this good in a pasta dish. He learned what many Sicilians have known for generations. Don’t be afraid to try this dish. You will be surprised at how great it taste as well. Summer is no time to spend hours in the kitchen preparing meals when the weather outside is so inviting. You can whip this up in minuets and sit on your patio sipping a glass of vino and enjoying this macaroni. Mint is a staple in my kitchen during the summer. Besides being a great ingredient for making a Mojito, I use it in everything from side dishes to dessert. What’s a Mojito you ask? I’m glad you asked. It’s a Cuban cocktail made with fresh mint, white rum, cane sugar, lime juice and seltzer (or 7-UP, depending on how sweet you like it). It’s a great way of using up all that mint over growing in my garden, and relaxing for the evening. Here is the formula: In a tall High Ball glass(remember those?) add about 5 mint leaves, the juice of 1/2 lime and 2 teaspoons of sugar. Mull it all together till it’s all mashed up. Add a couple of ounces of light rum and a splash of seltzer. Fill the glass with ice and enjoy. Add more sugar or 7-UP instead of seltzer if you like it sweeter. 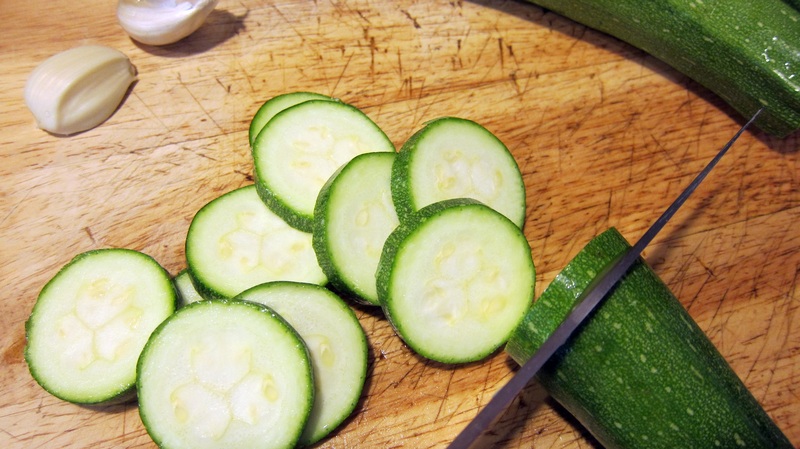 Slice the zucchini into 1/8 inch thick rounds. 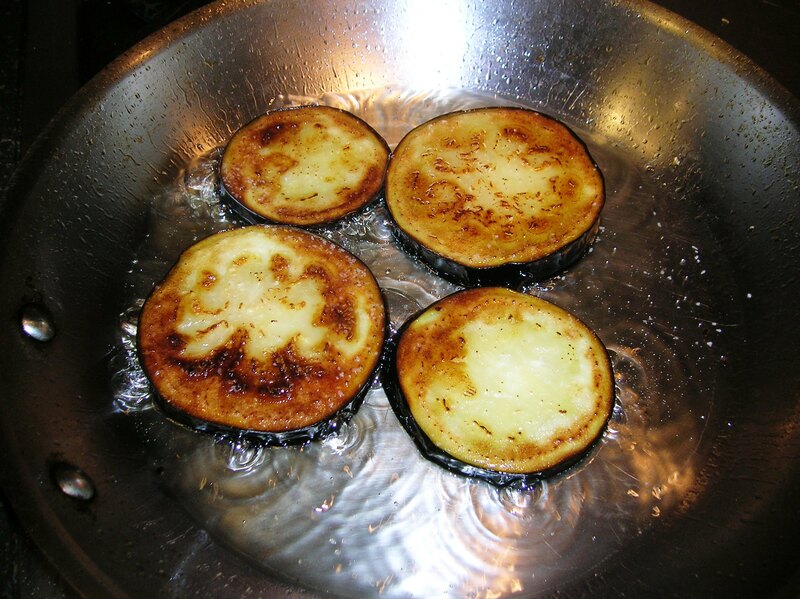 Heat the olive oil over medium high heat in a large frying pan. Add the zucchini and cook till slightly browned on both sides and tender. 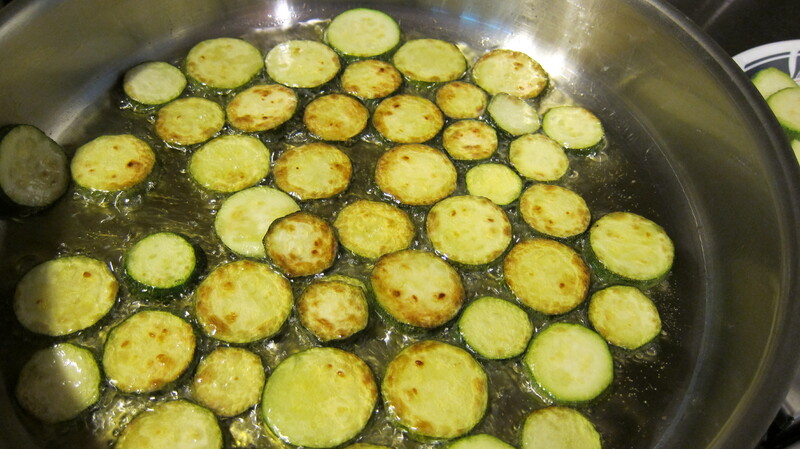 Cook the zucchini in batches so they are in a single layer in the pan. Add the garlic to the oil and cook a couple of minuets. Do not brown the garlic. 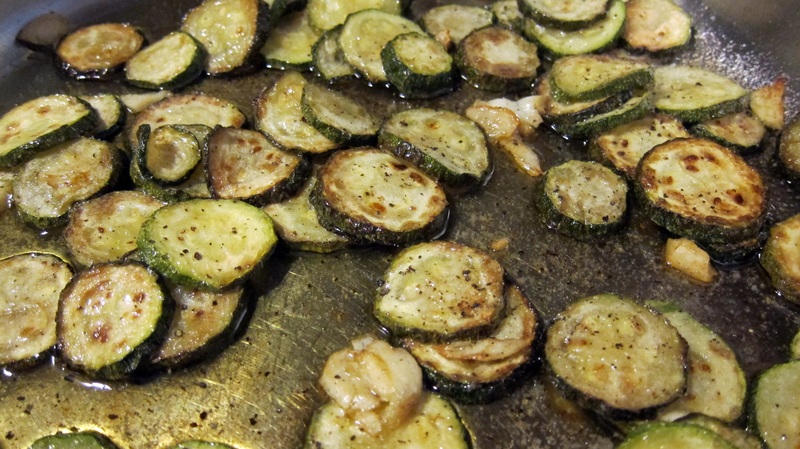 Return all the zucchini to the pan and remove from the heat. Add salt and pepper to taste. Cook the macaroni till desired tenderness. 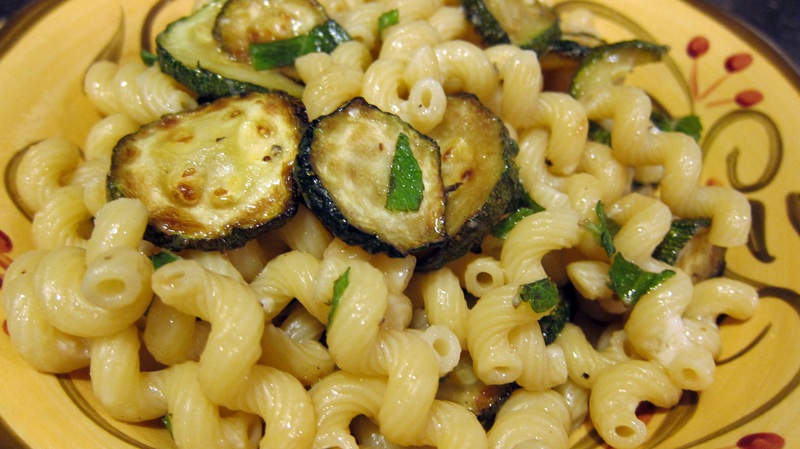 Drain the macaroni and add to the zucchini. Add the chopped mint and 1/4 cup of grated cheese. Toss to coat and serve with extra cheese. This has to be one of my all time favorite macaroni dishes. And it’s pure Sicilian. When I was 14 years old and traveled throughout Italy with my brother Richard we spent two weeks with my Aunt Angie and Uncle Benny in Sicily. We stayed at a small family run resort near the seaside town of Riposto, not far from Taormina. Riposto was the town my Uncle Benny was from. A memorable dish they served us for dinner one night was a plate of macaroni with a slice of fried eggplant draped over the top. I never tasted something so wonderful in my life. The macaroni was dressed with a simple light marinara sauce made of fresh tomatoes, garlic and basil. 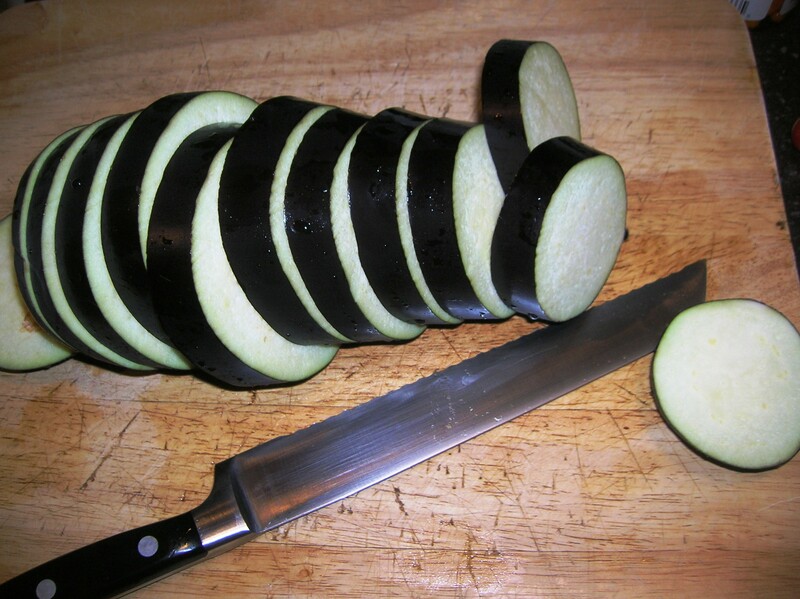 And sitting on top of the plate of pasta was two fried slices of eggplant. It couldn’t be more simple than that. 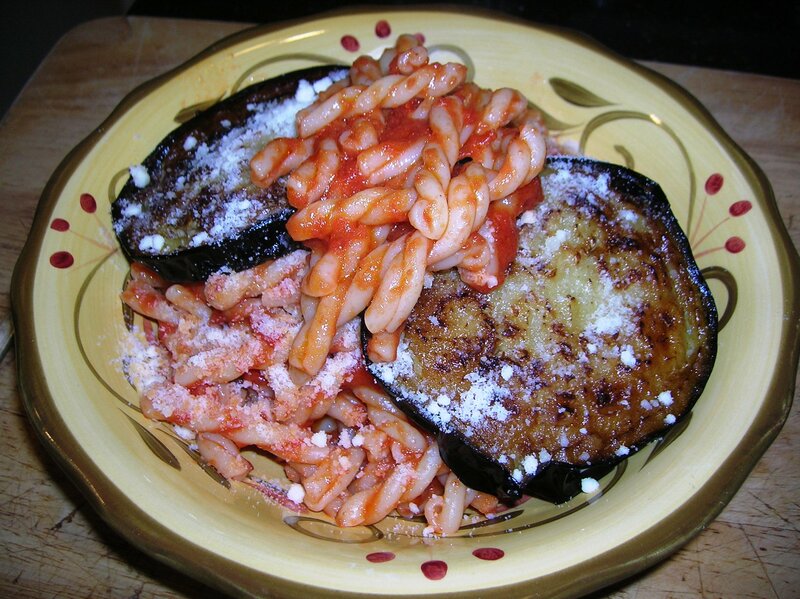 We cut the eggplant into the macaroni and sprinkled on some grated cheese. I’ve been making it that way ever since. And each time I dig into that plate I’m eating a slice of Sicily. In a large sauce pan, heat 4 tablespoons of olive oil. Add the chopped garlic and cook till the garlic starts to turn golden. 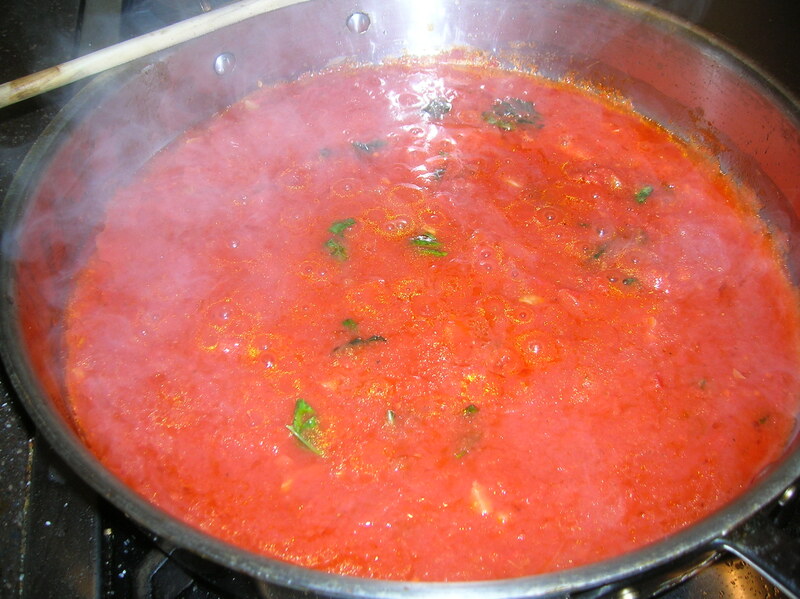 Add the tomatoes, sugar, salt and pepper and let the sauce simmer for about 15-20 minutes, or until the sauce thickens. The longer you cook the sauce the more flavor develops. Make sure you stir often when it thickens so you don’t burn the sauce. Taste for seasoning once the sauce is finished. When the sauce is cooked turn off the heat and add the torn basil leaves. 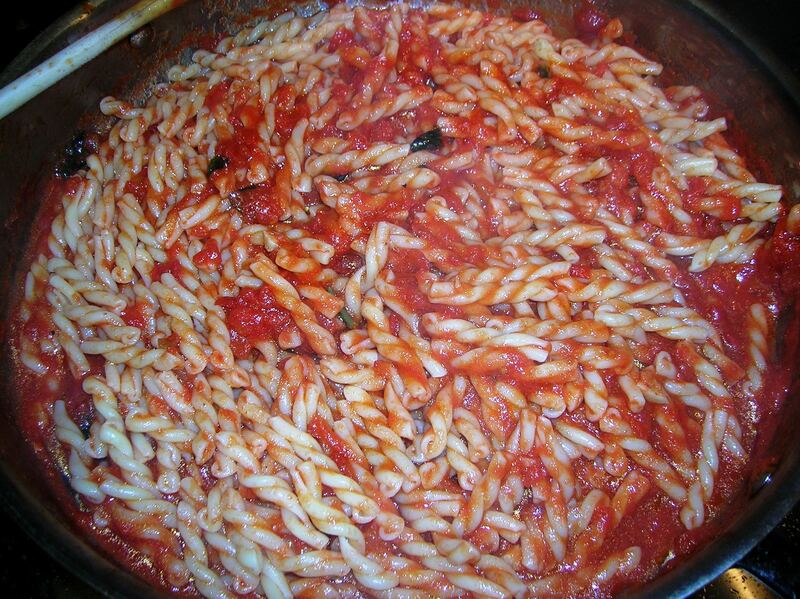 Drain the pasta and add it to the pan with the tomato sauce. Toss the pasta to coat it well. 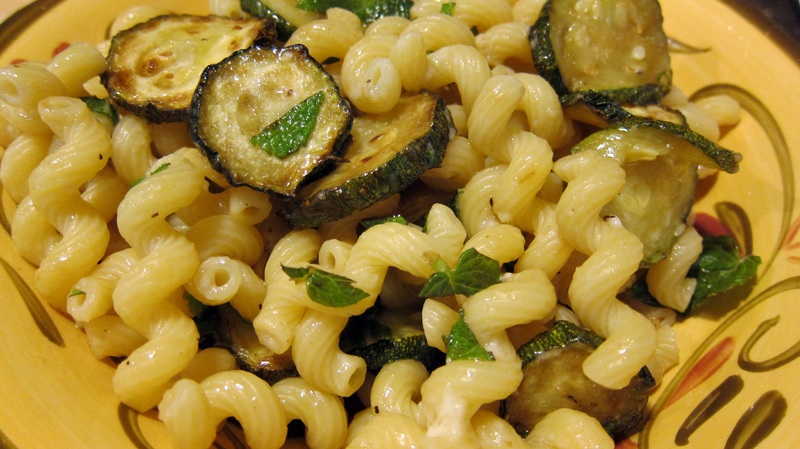 Place the macaroni in a bowl and top it with two slices of the fried eggplant. Sprinkle plenty of grated cheese on top and enjoy.